As his career gained momentum, Jones developed a deep appreciation for well constructed songs that also have emotional appeal His respect for songs that tell stories with meaning and beauty led him to record works by the greatest balladeers of all time. 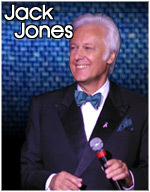 Jones' talent and commitment to his art earned him two Grammy's for "Best Pop Male Vocal Performance" with his singles "Lollipops and Roses" by Anthony Velona and Bacharach/David's "Wives and Lovers". His latest release,Jack Jones Paints A Tribute To Tony Bennett, was nominated for "Best Traditional Pop Vocal Performance". He was also nominated for "The Impossible Dream" and his recording of "Wives and Lovers" was nominated for "Record of the Year". His other hit records include "The Race Is On", "Lady", "Call Me Irresponsible" and "What I Did For Love". On April 13,1989, he was honored with his own star on the Hollywood Walk of Fame, close to where his father's star is located. On his latest CD release Jones pays homage to his friend and an American icon Tony Bennett.. He counts Bennett among those vocalists who most influenced his style (a small but elite group that includes Mel Torme, Sammy Davis Jr., Billy Eckstien, and Frank Sinatra). In selecting songs for this album, he chose three of his personal Bennett favorites, "Skylark", "Shadow Of Your Smile" and "You Must Believe In Spring". Today, Jack is busy doing Concerts in performing arts centers, as well as semi-annual engagements in Las Vegas.